Business challenges facing many current IT environments include data centers cluttered with legacy infrastructure, multiple sites over which to manage data, long disaster recovery times, and growing storage needs. 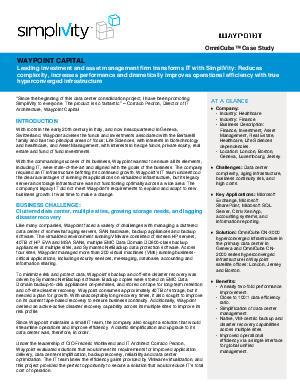 Waypoint Capital, a leading investment and asset management firm, was no exception. They realized that they had no redundancy at the server level, no proper backup in place, low performance, and no disaster recovery. They turned to SimpliVity's hyperconverged technology to solve all of these business needs while simplifying IT and reducing cost by 3X.